Sonos One vs Amazon Echo: Can Sonos beat Amazon's home team advantage? How do the two speakers stack up? After over a year of promises, Sonos has finally announced its own smart speaker. Called the Sonos One, the speaker will combine the intelligence of Amazon's Alexa with the multi-room capabilities of Sonos when it releases on October 24. Not to be outdone, Amazon has also announced some new additions to the Amazon Echo lineup. There are now a dizzying array of different Amazon Echo speakers from the screen-equipped Amazon Echo Show to the miniature Amazon Echo Dot, but for the purposes of this guide we'll be comparing the newly announced Amazon Echo, since this is likely to become the default version of the smart speaker going forward after it releases in November. Here's everything you need to know about how the two speakers compare. In terms of price, the Sonos One is much more expensive than the updated Amazon Echo. The new Amazon Echo will cost $99 / £89 / AU$149 when it goes on sale, while the Sonos One will cost $199 / £199 / AU$299. That makes the Sonos One over double the price of the new Amazon Echo. Depending on what you plan on using your smart speaker for, however, the extra money could be worth it. One of the biggest selling points of the Sonos One is sound quality. With a pair of Class-D amplifiers and custom built drivers, the speaker looks set to deliver the same high level of audio quality that Sonos has become known for over the years. Amazon's record on sound quality has historically been a little more patchy, with the original Amazon Echo being roundly criticised for lacking in bass. With the new Amazon Echo, the company has promised that it's going to improve the situation. The new speaker features a dedicated tweeter and a 2.5-inch downward-firing woofer. In our hands-on review of the new Echo we thought that these improvements lead to a clearer and more immersive sound. Of course, if audio quality is your primary concern, then Amazon has also recently announced the Amazon Echo Plus, which features Dolby Processing for a better level of audio quality. In terms of design, the Sonos One follows the same design philosophy as the company's existing Sonos Play:1 with a plastic finish that's available in either black or white. In this regard Sonos seems to be following in Amazon's footsteps, as the finish will sound very familiar to anyone who's spent time with the original Echo. With the new Echo however, Amazon has given its design an overhaul, introducing wood, cloth, and metallic finishes. All this means the new Amazon Echo is the slightly more versatile looking of the two speakers overall. 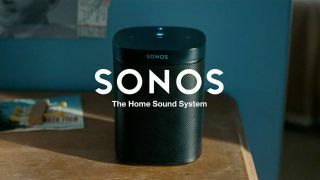 Sonos was the brand that essentially invented the multi-room product category, and it's hence not surprising that the Sonos One will integrate with your existing Sonos speakers. You can either pair it up with other speakers to play the same music, or else have different music playing in different rooms. You can even pair two Sonos Ones together for stereo sound, add a Sonos Sub to improve the bass, or pair them with a Sonos Playbar or Playbase to integrate them into a surround sound setup. The Sonos One will also support Apple's AirPlay 2 with a forthcoming update, which will bolster its multi-room capabilities when used with iOS devices. Amazon has also added some multi-room functionality of its own with a recent update. It's not quite as substantial as Sonos's offering, but it should allow you to play music seamlessly across your house from all of your Echo devices. Another key difference between the two speakers is physical buttons. While the Amazon Echo gets by with just four buttons (two for volume, one to wake Alexa, and one to stop the device from listening to you), the Sonos One is much more fully featured. The latter features touch controls that allow you to skip tracks without having to use your voice, which is helpful if you want to skip multiple tracks in quick succession (notoriously difficult when using voice controls). We initially suspected that Sonos's new speaker wouldn't otherwise have too much to distinguish it from Amazon's own hardware, but that was before the surprise announcement that the Sonos One will be made compatible with Google Assistant next year. The update will mean you should have the ability to summon either voice assistant to control your smart speaker. It's not yet clear how the two voice assistants will be combined. Presumably there'll be some option to switch between them in the Sonos app to avoid awkwardly summoning Google Assistant when you meant to ask for Alexa. Naturally, as an Amazon-made product, the Amazon Echo will stick to just supporting Alexa.